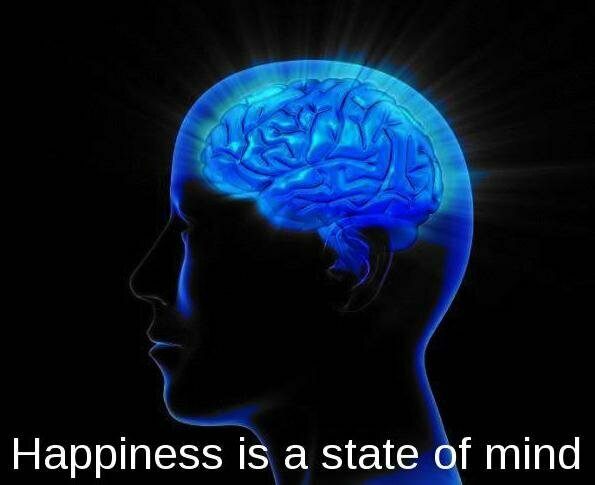 Step 3 Happiness is simply a mental state of well-being created by positive and good emotions. Happiness doesn’t come to us, but it can only come from inside us. Here is my post about Happiness comes from within. After having accepted the happiness is a choice and an attitude of mind, and having changed my attitudes from negative to positive, I have also learned that happiness is a state of mind and since we can create our state of mind, then we can create our happiness. But what is a state of mind: a state of mind is a temporary psychological state, the emotional and intellectual content of our mind at a precise moment. Basically, it’s what is going on in our mind, a mix of emotions and thoughts, which is created by how we feel inside which is a consequence of how we react to our external world, in various situations, with different people, locations etc. A state of mind can be created by external factors that have influence in our life, but most importantly a state of mind can be created by ourselves. As I mentioned before, in fact, our state of mind is the sum total of everything about us at a given time. It can be distraught, joyful, excited or any other emotion but basically, there is a positive, resourceful or negative, unresourceful state of mind. There are good or enabling states like love, joy, happiness, confidence, beliefs etc but there are even paralysing or bad states like depression, fear, anxiety, sadness etc. Our behavior is the result of the state we’re in and understanding our state is the key to understanding change and achieving excellence. It’s important what state we are in for when events happen, we react according to the state of mind in which we find ourselves. The way we perceive the world is largely dependent on our inner state of mind. If we are in a bad and negative state…. we see all dark and bad but if we are in a good state, like we are in love, or we are happy about a work promotions, we see all good and we don’t really bother much about anything else. We don’t let anything ruin our state. Most of our state of mind happen without us consciously realising it. For instance, we see or watch, listen to something and we respond to it going into a state, it’s the way we respond to it, most of the times it could be the memories we have associated with certain things that create our state. A state of mind could be a resourceful or unresourceful state. A resourceful state is when we do something like playing or something else and we don’t make any mistakes, and we are doing it very well. On the other hand, an unresourceful state is when we can’t do what we want. It’s important to learn to change our state so we know how to change our state whenever we are in a state that we do not want. We need to keep it in mind, if we want to control our mood or mental state, so we are not at the mercy of events and our emotions. It is very simple, with some mental gymnastics. Unlike the gym if we really want to change we can change it in an instant. What to do when we are in a bad, negative or unresourceful state? How can we change our current state of mind? When we realize we’ve ended up in a bad state, the first thing to do is to acknowledge it and make the decision to change this state. We need to be aware of what is happening, we can hold still for a moment and take a deep breath. We need then to focus our attention on something else. Then we can start using our physical body, in fact, changing our physical state can help change our state of mind. So what can we do? We can simply start changing posture, or start jumping fast, go for a walk, concentrate on our breathing. We can change the location of where we are, even only changing room could be helpful. To change our state of mind we can also create and use affirmative clues which are like mnemonic devices for the mind. There are two types of affirmative cues: memory-based affirmative cues and activity-based affirmative cues and I have been talking about them on How to replace our negative thoughts with positive thoughts. In the next few steps, I will also give some suggestions on how to create a Happiness state of mind.